Here I present you with three super easy, whip 'em out in mere minutes and send them to all your friends and relatives cards...all images are from justjohanna! No, it isn't about to snow again...good golly, I sure hope it's not about to snow again!! However, it was snowing when I made this card...or threatening to snow, which it does every single winter day here in the great white north. And one day, in addition to making simple cards, I am going to learn how to take a really good up close photo of my cards so you can see all of the detail that is so painfully missing from this photo! This card started as a lovely piece of pale blue cardstock. I then punched a hole right in the middle of my unsuspecting cardstock with my large square Nestibilities die cut. I then ran my now punched card through my Cuttlebug a second time to emboss the edges. 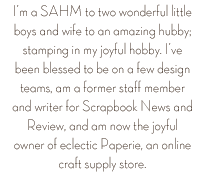 The oh so fun background stamp, of which Johanna has a bunch of, covered with fun words (this one all about the holidays) I stamped on whisper white, traced over the letters with a pale blue Copic marker and then attached, using dimensional tape, to the back of my opening. Next, I colored my snowman (how much coloring does one do on a snowman??) and attached him, again with dimensional tape, to the bottom corner of my card. And Mr. Frosty also received a dose of glitter...that would make him a Mrs. Frosty then, wouldn't it...or something we'd better not discuss on a crafting blog! ;-) PS - You can also purchase a LARGE Mr/Mrs. Frosty image from justjohanna too! This next number is even easier! A mere two layers of cardstock and a ribbon...I mean who couldn't whip out 12 of these a night! This coffee mug image is one of my all time favorite jj images. One, because I love coffee and two, because you can decorate your mug any way your little heart desires! Here I stayed with the cream/chocolate brown coloring on my mug, which has been paper pieced with some designer paper I had stashed away. The cream card was mounted onto a single piece of brown cardstock, to add some contrast, and the ribbon was the finishing touch. I thought about adding more but honestly, I really liked it the way it was! And last but not least is this little number using more of that pale blue paper (you know my office is a pale blue...what is it with me and pale blue...it's calming qualities perhaps?) and one red scalloped circle. 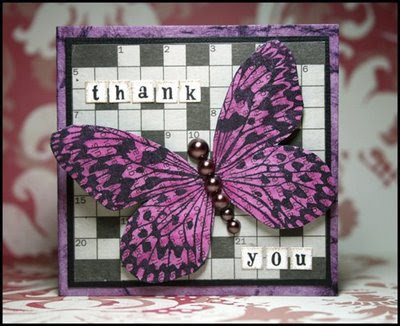 The scalloped image on the blue section of the card is a jj border stamp and one that I love to use. I stamped it once and then had the "hum...what if I just kept stamping" thought so...I kept stamping until I felt that I had enough wee little scallops. Then went on the red polka dot scallop and plain white circle with the sweet "me & you" sentiment. This would be a great little card to sneak into a hubby's overnight bag when he's away on a business trip...what a nice surprise! My husband never travels so...no cute card surprises for him...LOL! This week over on the SALT blog it was Hazel's turn to choose the topic for and she chose Contentment. You can read Hazel's write up on the verses that inspired her challenge here. My quick search through the Bible on verses focusing on contentment yielded three passages that I was drawn to; Philippians 4:11, Hebrews 13:5, and I Timothy 6:6. I chose to focus on I Timothy because of the almost forcefulness of the text, no fluffy words there! This portion of scripture should cut to the heart and make us really examine what we desire most in this life. My ATC states the first line of the passage, "Now godliness with contentment is great gain" but I included the entire passage on the back of the card. This would serve as a great memory verse! "Now godliness with contentment is great gain. For we brought nothing into this world, and it is certain we can carry nothing out. And having food and clothing, with these we shall be content. But those who desire to be rich fall into temptation and a snare, and into many foolish and harmful lusts which drown men in destruction and perdition. For the love of money is a root of all kinds of evil (**note** money isn't evil just the love of it), for which some have strayed from the faith in their greediness, and pierced themselves through with many sorrows." Kind of heavy stuff for a crafting blog...I know...but I can't help myself...sometimes I'm a deep thinker! LOL! If you've been inspired to create something based on this week's challenge, please pop on over to the SALT blog and leave us a comment with a link back to your blog or gallery! Sarah Schwerin, come on down! You have won the justjohanna Limited Edition Earth Day stamp! (pictured above) Please contact me at your earliest convenience with your shipping details. It's a justjohanna Earth Day challenge using newspaper! Who doesn't end up with more newspaper than you know what to do with...it can put into your recycling bin or you can use it on your paper crafting creations! I was in love with this look as soon as I cut out my first scalloped circle from part of my Sunday paper! I even used letters from the paper as my sentiment and tiny strips act as ribbons on the top of my card...just pull those "ribbons" gently! 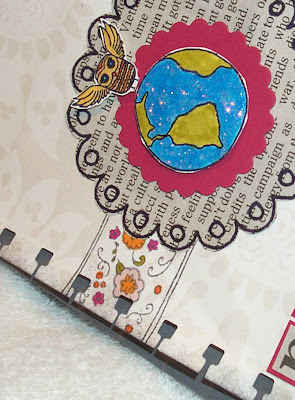 My challenge - Create a card, ATC, scrapbook page, whatever using newspaper! Post a comment on my blog with a link back to your blog or gallery. If you don't have a gallery, please feel free to post on the justjohanna forum, just click on the justjohanna forum link on the right hand side of my blog and post under the Earth Day thread. You'll have 24 hours to enter the challenge (4/20 at 9:00 am EST) and then I'll draw one winner from all of the newspaper challenge participants and one of you will win a Limited Edition Earth Day stamp from justjohanna. All of you will be entered into a drawing for one of the following prizes; $250 justjohanna shopping spree, a $50 shopping spree, 25% discount coupon. Tomorrow is the BIG Event!! It's almost here! The justjohanna Earth Day Extravaganza! You won't want to miss out on this fun-filled, creative day filled with challenges and prizes! I'll be posting my challenge at 9:00 am (EST). Visitors to my blog will have three hours to complete the challenge (top secret until tomorrow!) and leave a comment with a link back to their blog or *gallery. Everyone who participates in my challenge, or any of the other design team challenges, will be entered into a drawing to win a $250 shopping spree with justjohanna! 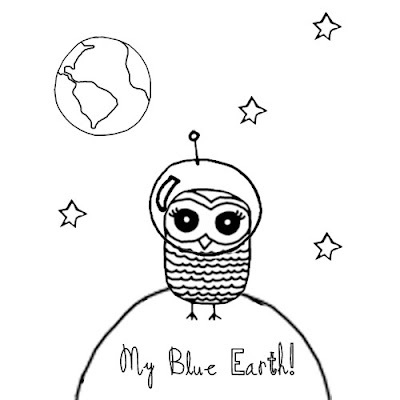 I will also be selecting one winner from all who participate in my challenge to win a limited edition Earth Day stamp, designed by one of the justjohanna design team members! *If you don't have a blog, your creations can be posted in the justjohanna gallery. Just click on the justjohanna forum button, located on the right hand side of my blog to visit the galleries and forum. All of the design team members will be posting challenges throughout the day and each will be announced on the forum, under the Earth Day Extravaganza topic. Looking forward to seeing what you all create!! I have always loved this justjohanna tree and I finally had an opportunity to use it last month. You can purchase this Spring tree, with the flower and leaf buds or a winter tree, minus the leaves. I'm partial to the Spring tree since living in the Northeast, the first signs of Spring is a welcome event after a cold winter! My sky and grass background paper is a few set from Stampin' Up! that is so Springy and fresh, full of beautiful soft colors and flowers! I created the first two rows of grass by using my SU! corner punch to make scallops. The then gave them a bit of aging for depth. And the chipboard heart has been colored and dipped in clear embossing powder to give it a glossy finish. Cards with new justjohanna Designs! Two cards I created using justjohanna's newly released images...my all time favorite? The cows! I love and adore the cows! They're fabulous! The second card is using a variation of the dancing ladies, from Johanna's dancing ladies kits, that are oh so much fun! How funny is a chicken (or maybe it's a bird) dressed up in fancy lady clothes?? The sentiment, "happy mum's day" is also new. Go check out all the new designs at justjohanna. Follow this link to a list of all of the new images! And "hay", have a great time! This week is was Gillian's turn to set the challange on the SALT blog and she chose "His Presence." His Presence, what does God's presence mean to you? Does it mean Comfort in time of loss, Strength when you face a battle, reassurance that you walk the good walk...or is it something you need to accept, is it something you want to be more open too. I had to think about this challenge for a bit...what did His presence mean to me? After reading through a few scripture passages, I hit upon Psalm 23. I've used these verses for a previous challenge and almost decided against using them again but there were a number of strong ideas that came to mind as I re-read the verses. Having a real relationship with God, as a daughter or son has with their earthly Father, through Christ - "The Lord is my Shepard, I shall not want..."
God's providence - "He makes me to lie down in green pastures...He leads me beside still waters..."
Forgiveness through Christ - "He restores my soul..."
God's glory - "For His name's sake..."
God's protection and comfort in times of great distress - "Though I walk through the valley of the shadow of death, I will fear no evil, for You are with me..."
God's blessings - "My cup runs over..."
Being in God's presence - "And I will dwell in the house of the Lord"
Only by God's grace - not because of anything in ourselves - are we able to anticipate the joyful experience of dwelling in the presence of our Savior, Jesus Christ, forever and ever! Oh yeah...the card details...this is an ATC that I created for the challenge using some delicious new (well, new for me) Crate paper - love, love, love the cream and black! This is the second ATC I've created for the SALT blog and you know what...I just might start a collection! Ohhhh...fun!! The stamp set is a brand new one from Stampin' Up! that I adore! I was excited about inking it up for the first time tonight!! As we do each challenge, the design team have created some beautiful pieces and we'd love to have you to join in with us. Post your piece onto your blog, with a link to SALT, then come and leave us a comment with your link so we can come and share your art. Lots, lots, lots to share so I'll jump right in with both feet!! 1) Johanna has launched her next Design Team search! Check out all the details on her blog here. Six month commitment, $200 starter kit, earn credits each month for even more free justjohanna stamps....be challenged, be inspired! 2) Johanna has posted a special deal for April!! The special deal is a bundled item in the shopping cart that is available for only one month. When you purchase the "deal," you get all five of the stamps, and the price is 25% less than the usual price. You can go straight there by clicking here. And when you've had a chance to use your new stamps, you can upload your creations right here. 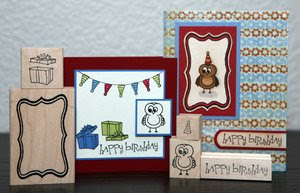 Here are the stamps and a few yummy cards created with the images! Happy sleeping...well, for some of us! 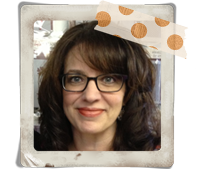 Starting this month, Johanna has challenged the team to create something (a card, canvas, scrapbook page, etc.) using the same object and any justjohanna images. For April it was a wooden bird, which she sent to the entire design team. I had been stashing a few small canvases to use for some project sometime and once I received my bird I thought I'd try my hand at a collage canvas. Humm...it took me a few days and I'm fairly happy with the outcome. I do wish I hadn't gone so crazy with my aging...me and my aging (it's not only on my projects but I fear across my face as well that I'm having a problem! LOL!). The piece ended up a bit darker than I had intended as my goal was to stick with Johanna's colors, a pale sand color and pink. Creating this piece was a fun exercise; one I hope to repeat in the near future! I painted the entire canvas with acrylic paint and then used brown ink to age the edges. I used two justjohanna floral images (one a border and one a corner border) to decorate the edges and corners of the canvas. I used my Copics to color in just the flower sections of the border images. The ripped/aged background paper is from a new collection of Basic Gray paper I just received (love the colors!). The bird is also covered in paper from the same collection. The large scallop circle was created with my Nestibilities. I die cut a large scalloped circle and then used a plain circle to cut out the middle of the scalloped circle, leaving me with a thin border. The pink felt heart was stitched around the edge and buttons were added as an accent. The justjohanna image was printed out on a transparency and then cut into a tag shape. The large grommet was added to the tag to hold the stamped twill (the La Chripe sentiment is from jj). The bird's eye was created using a tiny velvet flower and antique brass brad and the wing is actually a "fancy tail" stamp from jj. Whew...aren't you glad that explanation is over! LOL! Enjoy and have a birdie good evening!